The throne was set and only One sat who was seen in Ezekiel as the Father (Ezekiel 2:27, 28). 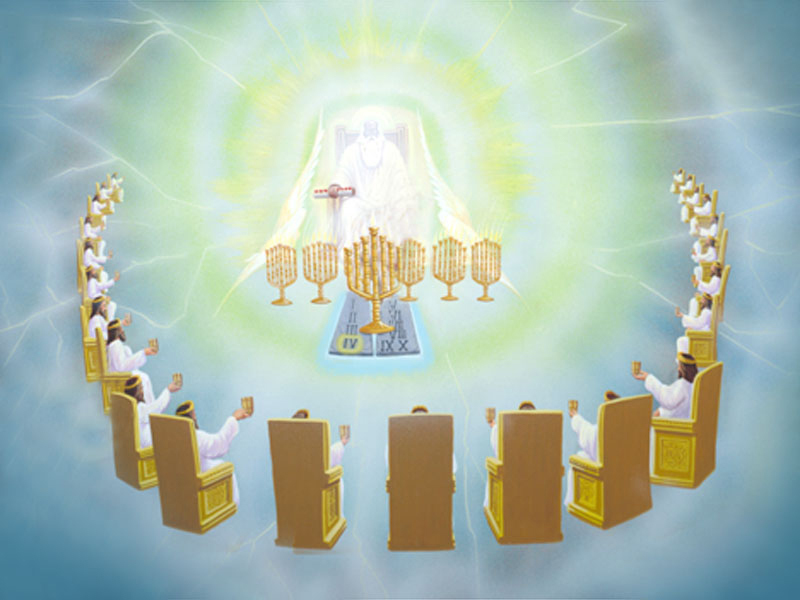 The twenty four elders are there, clothed in white with gold crowns on their heads who are said to be "the sons of God, the representatives of the unfallen worlds," (DA 834.1) We see the seven Spirits of God, which represents the Holy Spirit; the perfection and the variety of the gifts by which He works through an (see 1 Cor. 14:4-11). Everyone is there, but someone is missing! 1. What did John see opened in heaven? 2. What was in that room that he saw opened? “And immediately I was in the spirit: and, behold, a throne was set in heaven, and one sat on the throne,” (Rev. 4:2). NOTE: This door was a door into the heavenly sanctuary. Psalm 11:4 says, “The LORD is in His holy temple, the LORD’S throne is n heaven,” (see also Psalm 102:19). Also, in the earthly sanctuary, which is modeled after the heavenly, the glory of God filled the temple, (Exodus 40:34). God’s glory called the “Shekinah” was right above the ark of the covenant which housed the Ten Commandments. This was located in the most holy place, the second room or inner room of the sanctuary, (Hebrews 9:2-5). 3. What was John shown in the vision in the heavenly sanctuary? After this I looked, and, behold, a door was opened in heaven: and the first voice which I heard was as it were of a trumpet talking with me; which said, Come up hither, and I will shew thee things which must be hereafter,” (Rev. 4:1). NOTE: John was shown things which must come to pass. 4. What did John see around the throne? “And he that sat was to look upon like a jasper and a sardine stone: and there was a rainbow round about the throne, in sight like unto an emerald,” (Rev. 4:3). NOTE: The rainbow is a symbol of God’s covenant and promise to mankind, (Gen. 9:12-17). 5. Who did John see around the throne and how many were there? “And round about the throne were four and twenty seats: and upon the seats I saw four and twenty elders sitting, clothed in white raiment; and they had on their heads crowns of gold,” (Rev. 4:4). NOTE: It is important to notice that these individuals are ALREADY in heaven. This will prove to be important later. 6. What were they dressed in, and what did they have on their heads? 7. What proceeded out from the throne? “And out of the throne proceeded lightnings and thunderings and voices: and there were seven lamps of fire burning before the throne, which are the seven Spirits of God,” (Rev. 4:5). 8. What did the “seven lamps of fire burning before the throne” represent? NOTE: The number 7 symbolizes perfection or completeness. The Holy Spirit is perfect as a member of the Godhead. 9. What was before the throne? “And before the throne there was a sea of glass like unto crystal: and in the midst of the throne, and round about the throne, were four beasts full of eyes before and behind,” (Rev. 4:6). NOTE: This is described several times in the Bible. Lucifer at one time walked up and down on these stones of fire. Compare (Revelation 15:2 and Ezekiel 28:14, 15). 10. In each proclamation that these awesome beasts surrounding the throne make day and night, how many times in each proclamation do they call out the name “holy”? “And before the throne there was a sea of glass like unto crystal: and in the midst of the throne, and round about the throne, were four beasts full of eyes before and behind. And the first beast was like a lion, and the second beast like a calf, and the third beast had a face as a man, and the fourth beast was like a flying eagle. And the four beasts had each of them six wings about him; and they were full of eyes within: and they rest not day and night, saying, Holy, holy, holy, Lord God Almighty, which was, and is, and is to come,” (Rev. 4:6-8). 11. What do the 24 elders do when these beasts shout out glory, honor and thanks to the Godhead? “And when those beasts give glory and honour and thanks to him that sat on the throne, who liveth for ever and ever, the four and twenty elders fall down before him that sat on the throne, and worship him that liveth for ever and ever, and cast their crowns before the throne, saying,” (Rev. 4:9, 10). NOTE: One day, those who will be saved will shout and praise God when they enter into His courts in an act of worship and love for the great salvation He provided through His Son. 12. Why did the elders say the Lord God was worthy to receive honor, glory and power? “Thou art worthy, O Lord, to receive glory and honour and power: for thou hast created all things, and for thy pleasure they are and were created,” (Rev. 4:11). It is impossible to worship the God of heaven as Creator if we willingly fail to observe the seventh-day Sabbath. The reason for this is because the Sabbath was given to mankind so that they would remember their Creator. Claiming to worship the Creator and yet breaking the seventh-day Sabbath command would be like saying you love your spouse and yet have another lover on the side. The only way that the seventh-day Sabbath could be done away with is that another God more powerful than God destroy the entire universe, create a new one, and give another day in memorial of His creation. (see Luke 16:17, Mark 13:31; 3:27). But there is no other God. There is only ONE God: Father, son and Holy Spirit. The Godhead that crated all things gave the Sabbath as the sign of Their creatorship.